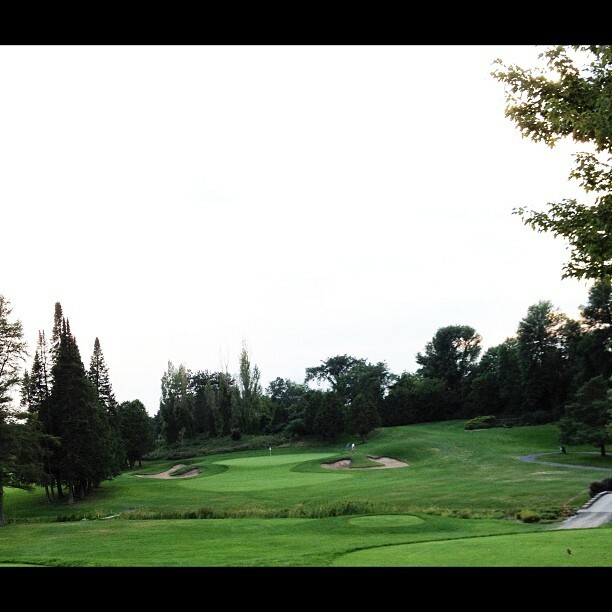 Last week I had the pleasure of finally getting to play golf Rideau View Golf Course outside of Manotick. It was just recently rate #81 on Score Golf's Top 100 Canadian Golf Courses a huge leap considering it wasn't even on the list in 2011. Rideau View is also known for being the home course for golf pro Brad Fritsch who is currently playing the Web.com Tour and trying to break into the Top 25 to get his PGA Tour for next year. He's currently 41st on that list. 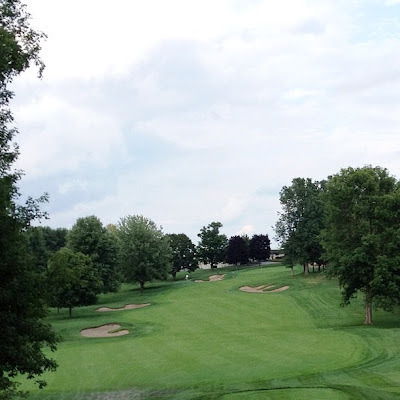 Rideau View is just a few minutes away from where I live but I've never actually played it before not because it's a private course just because I'd never got around to asking. So with the power of Twitter and a few messages back and forth with Steve Ducat the GM at Rideau View. We were able to pencil in a date for my Father-In-Law and I to play the course. Boy was I finally happy I asked? Now I know why panelists from Score Golf rated Rideau View Golf Course one of the top courses in Canada. Amazing Views - No Houses Yeah! As you drive up the road to Rideau View you can see why the designer used the highest point of the land to place the Clubhouse. To not only enhance the beauty of the golf holes but to showcase the best views as well. We chatted with Tim at the Pro Shop and checked in for our round. Finally meeting Steve Ducat after so many emails back and forth was great. He gave us a tour around and showed us Rideau View's State of the Art Trackman Club Fitting Center. Members and non-members can get fitted by a golf professional. Rideau View has the top 8 Golf Manufacturers to test out your swings. The first hole at Rideau View is a great starting hole with lovely mature trees down both sides of the fairway. From the whites it's 491 yds so it's not overly long but the green is small and the greenside bunkers left and right will gobble up your ball if your not accurate. My Father-in-Law noticed right away after playing the hole that the greens at Rideau View are quite fast and we'd have to figure them out quick or we were in for a lot of three putts. Rideau View is a classic "old style" golf course. From the tee box the course is laid out for you sight lines are fabulous. There are no blind tee shots and landing areas are visible and generous. Gordon MacMillan, the Course Superintendent and his staff have done a great job from the beautifully manicured fairways to the well crafted bunkers. You really have to like a course that you can distinguish the first cut from the second cut of rough. Hats off boys! It's really hard to pick my favorite holes at Rideau View but these three made the cut. What are your favorite? I just really loved the look of this hole. It really fit my eye from the elevated tee box. With beautiful trees up and down the fairway you can't stray to far off the fairway with your tee shot. After a shortish drive I managed a good second shot but couldn't get up and down from just off the green. Bogey is definitively not a bad score on this hole. The sun was shining when we arrived on #13 and once again you have a great little par 4. With a generous landing area you can rip a drive on this hole avoiding the bunker on the right side. Had one of my better drives on this hole. Second shot came up a bit short and managed a two putt bogey. Like most of the holes at Rideau View the greenside bunkers are to be avoided. Beautifully conditioned but damn hard to get out of sometimes. Hole #15 is a fun little par 3 that plays about 153 yds from the whites but can be deceptively hard. You are playing from a elevated tee box as well as wind conditions can definitively effect your club choice. Didn't hit a real solid shot here but managed to get up and down for a par. 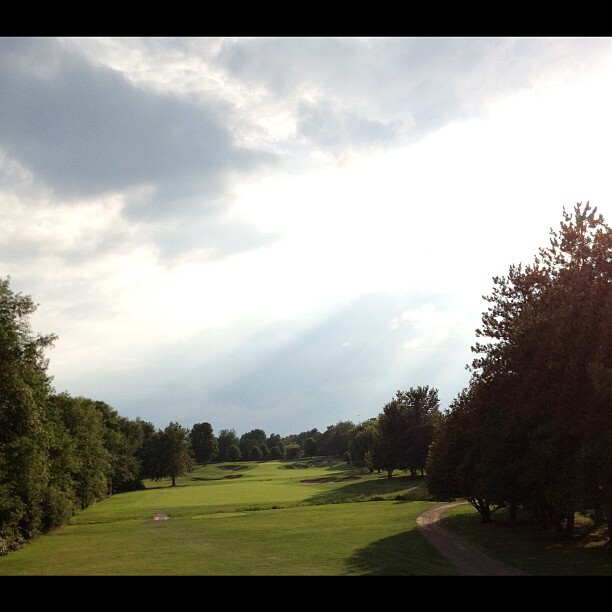 My Father-in-Law and I had a great time playing Rideau View. Jump at the chance if you get an invite. It's a top notch Private Golf Course with great staff and a friendly atmosphere. I can see why it's been included in Score Golf's Top 100 Canadian Golf Courses. With its classic old school feel I can see why many members have chosen this course to be their course. Beautiful ! Rideau – I want to play golf in there now.